If you have studied logarithms, you have John Napier to thank for their discovery. He died 400 years ago today. John Napier was a Scottish landowner, mathematician, physicist, and astronomer, but is probably best known as the discoverer of logarithms. Before calculators became widespread in the second half of the 20th century, logarithms were widely used to perform multiplication of numbers, particularly large numbers. Logarithms were looked up in "log tables". Logarithms have many uses and come into many areas of modern maths, and if you have studied beyond GCSE level, you will be very familiar with them. 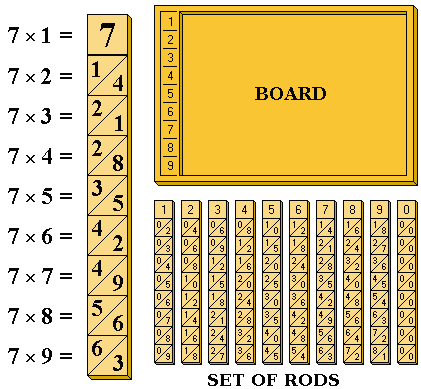 The natural logarithm (log base e) is sometimes called the Napierian logarithm, although Napier didn't explicitly work with base e.
Napier also invented "Napier's bones", which were a set of wooden rods inscribed with digits, and were another tool for performing multiplication. Napier was also one of the earlier mathematicians to make frequent use of the decimal point in his work and helped to popularise this idea. Napier's birthplace, Merchiston Tower in Edinburgh, is now a part of Edinburgh Napier University, which is named after him. Napier died in 1617 at his home at Merchiston Castle from the effects of gout, but his revolutionary work on what became a key part of modern mathematics will ensure he is remembered for a long time to come.